I’ve just survived a two hour screening of one of the most pretentious, privileged films I’ve seen in years. Woman meets man in bookshop. They marry. He dies. She travels to a small seaside town in England to open a bookshop. The locals aren’t enthused. Woman makes friend with local recluse, also widowed, and they bond mildly over books. There’s no real explanation of why the locals would resist a new bookshop in their little village, aside from the protestations of a town elder who has a vision for an “Arts Centre” in the “Old House” where the bookshop sets up. 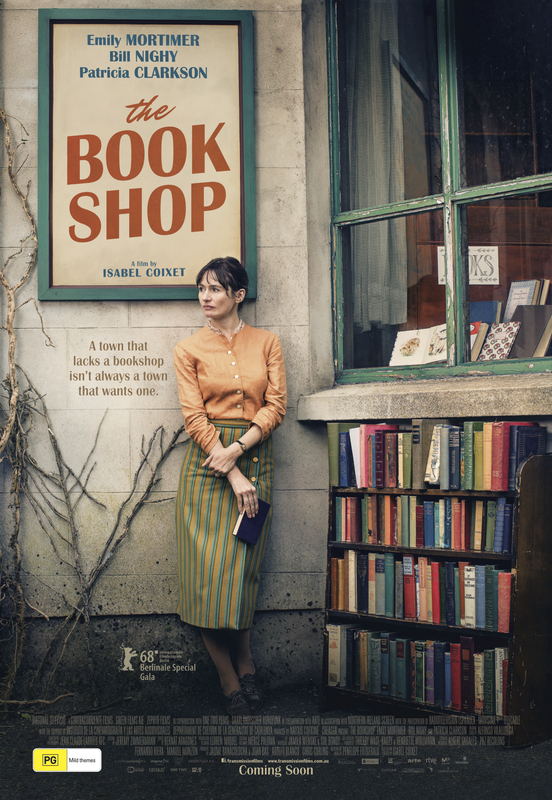 It’s 1959 and Emily Mortimer plays Florence Green, a courageous spinster opening a book store in an old house that has sat vacant for 7 years. Was it her old house? Did it hold some special place in her life, or in the life of the community? Who knows?! Bill Nighy plays Edmund Brundish, who lives alone in a once grand mansion, atop the hill overlooking the village of Hardborough, Suffolk. The film moves at an interminable pace, features wooden performances and unlikeable characters and unremarkable cinematography. Perhaps this literary adaptation is faithful to the source material, which would seem to be a loving homage to the bookshop woman who inspired the author to open her own bookshop. It possibly reads better as a book than to experience as a motion picture. Impossible to say as nothing seemed to happen and nothing was explained. I never thought you could make Emily Mortimer and Bill Nighy look bad, but in this respect the film is a complete success. Perhaps your comments may be a little on the harsh side. I loved this film and gave it four out of five stars for reasons set out in my review. Glad you liked it! Wish I had!